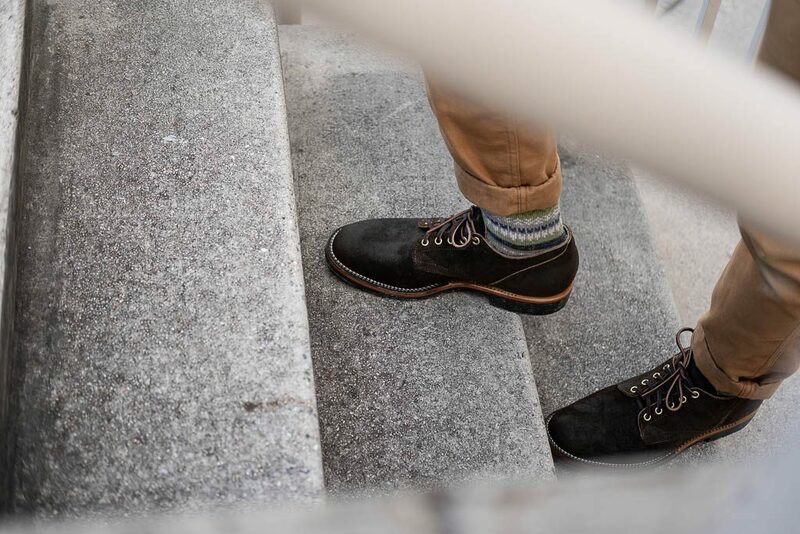 After our first Viberg for Withered Fig release, we were excited to see what else was next and what we could create with Viberg. We went through a few different ideas from another Service Boot, to a Slipper, and various smooth and roughout leathers. Ultimately, the stars aligned for our second makeup to come out of the Viberg factory exclusively for Withered Fig – the 145 Oxford in Mushroom Chamois Rougout. Noting the lack of 145 Oxfords currently available, we scoured the internet and took inspiration from some folks who rock the 145 Oxfords very well on Instagram, and created a make-up that was suited for the everyday man who can appreciate the 145 Oxford’s fulsome, yet timeless appearance. 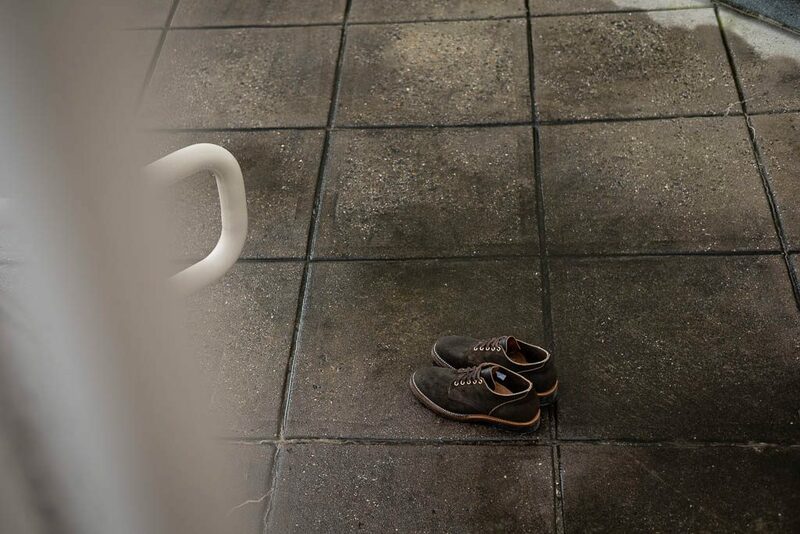 The 145 Oxford is one of Viberg’s older silhouettes that features a chunkier mold that lends itself to a true heritage work shoe. 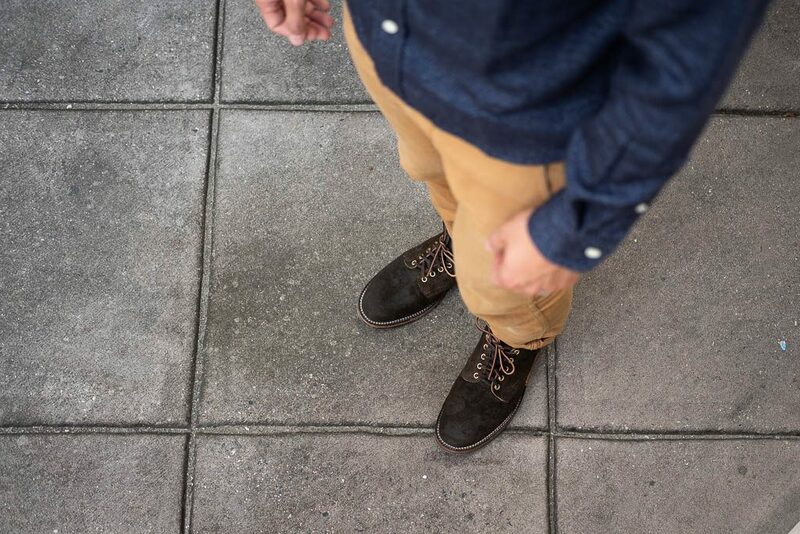 While we certainly think this can be dressed up with some trousers and a button-up tucked in, we think these boots are perfectly matched with your standard casual outfit, whether it be work wear, a bit more prep, or just some vintage plaid vibes. What really ups the versatility is the cross-combination of the Mushroom Chamois Roughout leather, which in our opinion is an extremely classy and refined leather, and the Raw Corded soles that brings in that field-wear and rugged vibe (more on that towards the bottom). The Chamois leather (reversed) is heavily oiled and weathers well under rainy conditions (just don’t go swimming in it!). On top of that, it shows its resilience towards surface nicks and scuffs with some light buffing of the leather with your fingers. In cooler lighting, this leather takes on a stark, cold, dark olive-brown, and in warmer lighting the leather showcases some of that mushroom brown color. Now when it comes to the last and structure, as evidenced by our first makeup – the Aged Bark Roughout ‘Marvington’ Service Boot, we were once again drawn to the 1035 due to our bias towards it, given the nice balance between room in the box and a sleek toe. This time though, the toe is unstructured, which means over time it will start to collapse a bit. We believe the unstructured toe will age beautifully as it collapses and creases to solidify the look of a true vintage work shoe. 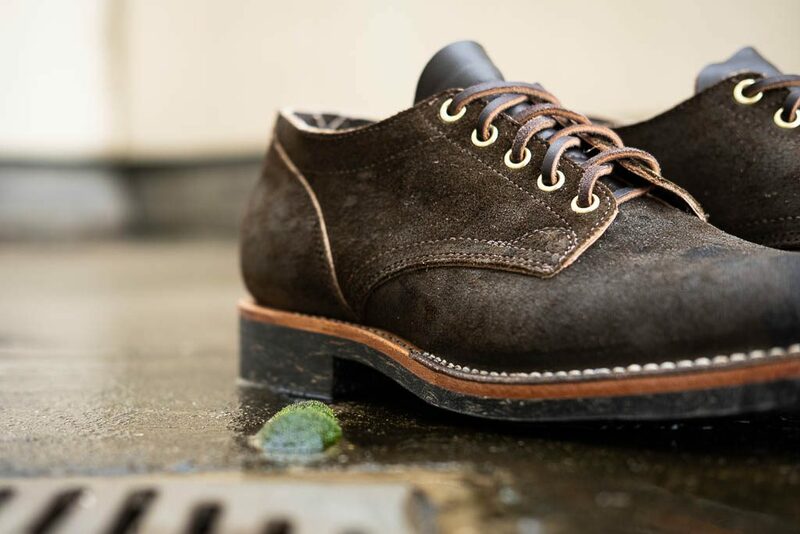 And similar to our first Viberg, we threw in a contrast tongue in the form of the Brown Oil Tan leather, which breaks up the unity of the shoe when viewed from the front or the top-down. Five Vintage Brass Eyelets complete the variance in the look by adding some rich brass color back into the fold. Corded soles had been widely used since 1940s or earlier. They were well-know for USMC field boots (a.k.a. boondockers) during WWII. There were several reasons for mixing cord into rubber compounds. 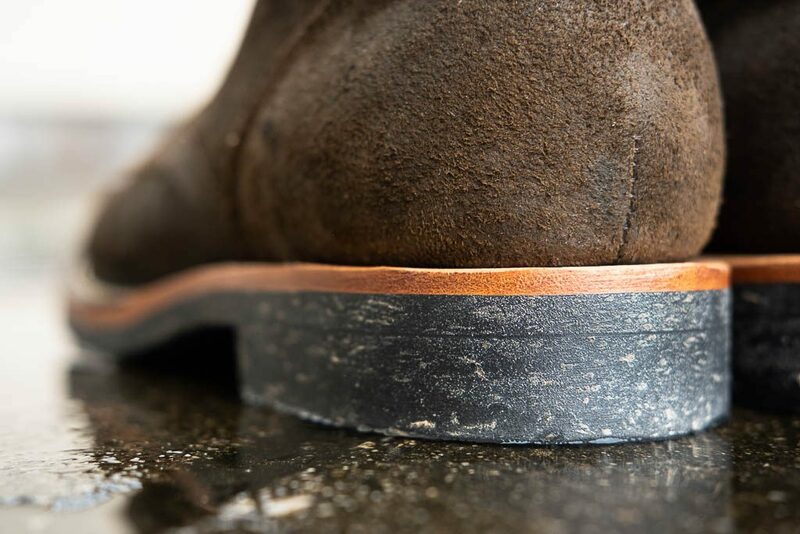 One reason was to save to use of rubber during the wartime, and some people claimed that adding cord could reinforce the traction and grip on rubber sole, especially when the rubber compounds back then were not as as functional as they are today. However, the true reason is still inconclusive. One thing for sure is that corded soles would definitely make the boots/shoes look nostalgic and extraordinary! 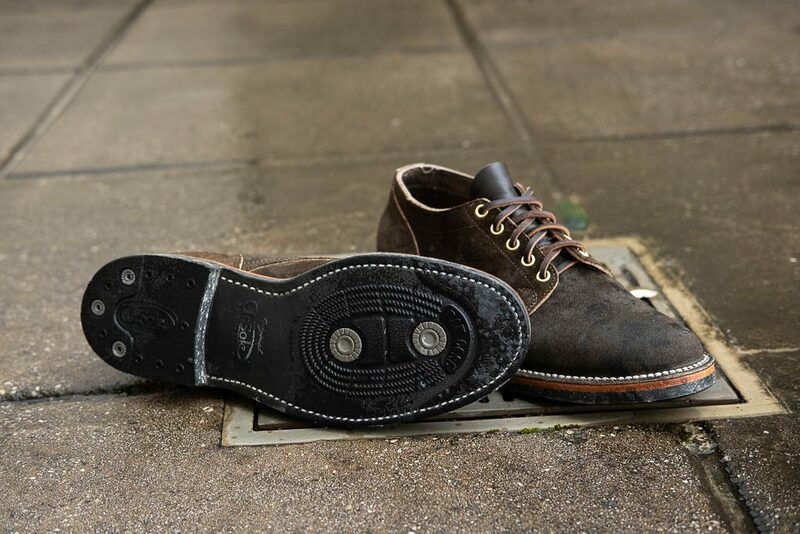 The rubber compounds used on our Raw Cord sole series is nitrile rubber, which is oil-resistant and long-wearing, making the soles perfect for work boots. Moreover, unlike the nylon cord used on other corded soles in the market, we use pulverized natural hemp cord, which is an old fashion way and thus, more like the original version. For sizing information, see our Measuring Guide and check the product page for the additional reference sizing, by clicking on the Size Chart tab. In brief though, most people should take the same size in the 1035 last, as they do in the 2030. The exception is if you have narrow feet (smaller than D width), you may find the 1035 last a bit wider than you would like if you stayed the same as your 2030. At the same time, if the length is already perfect or just a tad tight on the 2030, sizing down a half will inevitably be too tight in length; you may have to compromise then. Debuting at the Fairfax Fall Festival, October 13th from 10am to 5pm, with the remaining sizes going online Sunday, Noon EST on our webstore. Details on the Fairfax Fall Festival event can be found on our previous blog post. 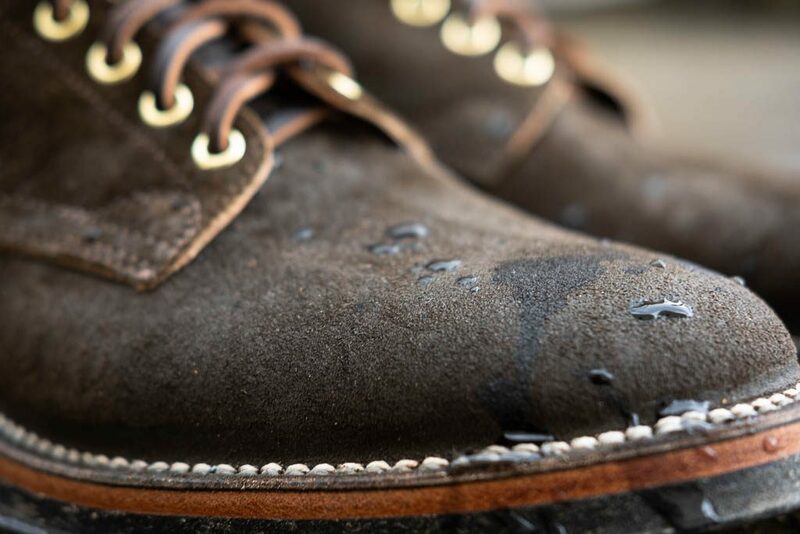 Introducing our second Viberg for Withered Fig, Mushroom Chamois Roughout 145 Oxford.